Why not take a kitchen timer and modify it to make a 60 min rotating time lapse? the timer from jimstringfellow on Vimeo. Golden Gardens GoPro Pan from jimstringfellow on Vimeo. 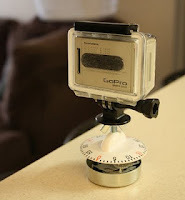 Item Reviewed: GoPro & a Kitchen Timer- Time-lapse Shots 9 out of 10 based on 10 ratings. 9 user reviews.